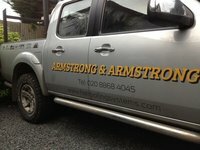 Armstrong & Armstrong Roofing Contractors are a family run business established in 1977. We pride ourselves on offering first class workmanship to our clients, which includes a full range of roofing services from minor repairs to complete roof renewals, specialising in flat roofing. We take pride in the quality of our work and are members of NFRC, Trust Mark, CHAS and Competent Roofer Scheme, which allows us to self certify your roof to current legal requirements. We only use materials of the highest standard. This together with our experienced craftsmen carrying out the work, guarantees excellent results every time. Contact us today for a no obligation quote or advice. Hayden and his team were outstanding. They arrived on time, worked all the way through and finished on schedule. They even waited until they'd done a couple of hours work before they accepted a cuppa! They were polite, tidy and a pleasure to deal with. Would have no issue recommending them to others. Excellent job done, by extremely nice and pleasant workforce. Everything went smoothly from quotation to starting and finishing the work on time.All rubble was cleaned up and taken away as promised. I would certainly recommend them. Arrived on time and carried out required work in a timely manner. As this was to fix a serious leak, A&A had already made a temporary repair to stop further damage without prompting from the customer. Excellent job by Armstrong roofing! I had many issues with other contractors . Armstrong roofing resolved all the problems with my flat roof. Very professional service. Quick, helpful giving honest advice. Armstrong roofing saved the day ! Would highly recommend this company. I contacted Hayden at Armstrong and Armstrong who came to give me a quote for sorting my roof problem. He gave me quotes for two ways I wanted costing.He explained fully the difference between the two quotes.I went with his suggestion and am very glad I did.A real professional and very good to deal with.Thank you Hayden for a quality job. Wooden fascia replaced by side of garage removed some of the roofing felt that covered fascia and replaced accordingly. Immaculate quality of work, good customer service. Great service. Knowledgeable and efficient. Were able to fix broken roof tiles as well as replace old guttering and identified what the problem with a faulty gutter was caused by. Highly recommended.